Ill inois Primary Voting Begins Today. 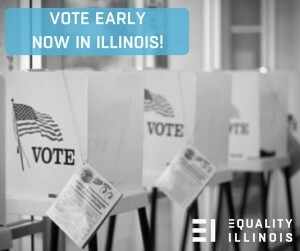 As ‪LGBT‬ citizens in other states are battling for their basic rights, the successes we’ve worked so hard for in Illinois were built on the fact that our community and our allies have voted for officials who represent us. And, we have more work to do locally and nationally. Be sure to vote in the March 15 Illinois primary, or vote now at an early voting polling place, or vote by mail. Check your early voting location, your March 15th polling place, how to vote by mail and your voter registration status.